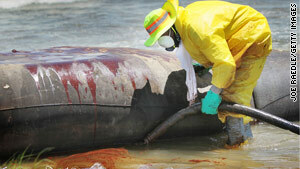 Most of those who reported sickness were either workers on oil rigs or people involved in cleanup efforts. (CNN) -- Exposure to the oil disaster in the Gulf of Mexico has resulted in 162 cases of illnesses reported to the Louisiana state health department, according to a report released Monday. Of those cases, 128 involved workers on oil rigs or individuals involved in the oil spill cleanup efforts, the report said. Among the most common reported symptoms were throat irritation, shortness of breath, cough, eye irritation, nausea and headaches, according to the department's oil spill surveillance report. The weekly report gathers data from a surveillance network of doctors, clinics, emergency care locations and medical facilities. According to the most recent report, since the beginning of the oil spill, of the workers who reported illnesses, 120 were male and eight were female. Of the general public affected, nine were male and 25 were female. Most of those who reported symptoms were between the ages of 18 and 64, the report said. There were six illnesses reported the week of June 20, a sharp decrease from a high of 38 reported illnesses the first week of June, the report said. Several of the workers who fell ill reportedly had been exposed to fumes from the dispersants being deployed in the Gulf, the report said. Most of those affected worked on the cleanup efforts in some way. Twenty-three of those with symptoms worked on an oil rig, the report said. Most workers went to an emergency room or an urgent care center when they developed symptoms. At least 21 people were briefly hospitalized. In a related development, Louisiana Department of Health and Hospitals Secretary Alan Levine asked Monday that BP pay $10 million to fund six months of mental health services to people affected by the spill. "There exists anger, anxiety and uncertainty among the families and communities affected by the spill, which will easily manifest into addiction and various forms of mental health crisis if not confronted," he said in a letter to BP Chief Operating Officer Doug Suttles. Teams have counseled almost 2,000 people in affected areas, and are reporting increases in anxiety, depression, stress, grief, excessive drinking, earlier drinking and suicidal ideation, he said. "These are early warning signs of developing substance abuse and dependence, mental illness, suicide and familial breakdown including divorce, spouse abuse and child abuse and neglect." In a separate request, Catholic Charities is seeking $3.2 million for six months of mental health services, he said in the letter, which asked Suttles to respond within a week.